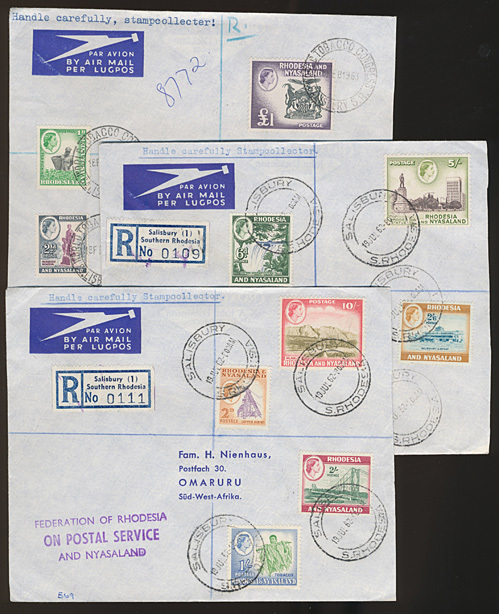 1962-63 19th July and 18th February, 11 values from the definitive set variously applied to three covers. One with values to £1 cancelled special 'WORLD TOBACCO CONGRESS / 18 FEB 1963' datestamps, the other two cancelled 'SALISBURY 19 JUL 62'. All on the same style envelope and to the same printed addressee in South West Africa. Sent registered airmail and with arrival backstops. Most attractive.